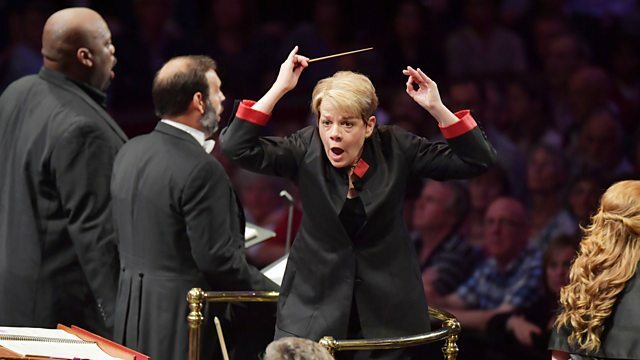 Live from the Royal Albert Hall in London, Marin Alsop conducts the BBC Proms Youth Choir and the Orchetra of the Age of Enlightenment in a performance of Verdi's Requiem. Verdi's shattering Requiem - which began life as a memorial to Rossini - was so forthright in its expression of grief, faith and judgement that many thought it too dramatic for performance in church. In the penultimate Prom of 2016, Marin Alsop leads the period instruments of the Orchestra of the Age of Enlightenment and the fresh voices of the BBC Proms Youth Choir through all the passion, turbulence and reflection of Verdi's sacred masterpiece. Conductor: Marin Alsop. Orchestra: Orchestra of the Age of Enlightenment. Choir: BBC Proms Youth Choir. Performer: Tamara Wilson. Performer: Alisa Kolosova. Performer: Michael Fabiano. Performer: Morris Robinson. Choir: Arnold Schönberg Chor. Ensemble: Members of the Wiener Concert-Verein. Conductor: Erwin Ortner.